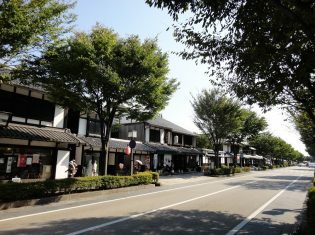 The Serigumi group houses are located between the castle's outer moat (currently the Showa New Road) and the Seri River. The low-ranking samurai soldiers of Hikone Domain were paid an annual stipend counted in units of rice (three persons' share of 22 sacks of rice), and lived in the city's fourth quarter--in other words, its outermost district--where it was their duty to protect the castle town. The group residence here was first established in 1606 by the Nagayabu Foot Soldiers, but due to an increase in troop numbers, the Serigumi established an additional 8 units to the rear of Hikone's Kawara-cho district. Later, in 1629, residences were constructed for the Kiritoshi-kami and Kiritoshi-shimo Groups to the east of Kawarayaki-cho, and for the Daiunji Group to the south of Yasukiyo-cho. The time period during which the middle and north groups were constructed is unclear. The Serigumi is the largest of the residences, at a length of 750 meters east-west, and 300 meters north-south, and this foot soldier residence is preserved in its original shape to this day. The streets are purposefully constructed to be narrow and winding, with many turns, to make them easier to defend. * These houses are currently the homes of Hikone residences, so please be advised that they are not open to entry by the public.